The Buland bharat ki buland tasveer........" The Hamara Bajaj" the King of Scooter and Bike market Bajaj Auto, announced the launch of RE 60, an ultra-low cost car in this Auto Expo 2012 .In this Auto Expo RE 60 is the center of attraction because everyone were waiting for Bajaj's first car. This was a enigma that how's its looks, engine and its Price?And will it cheaper then NANO?? The company claims that the car would have a mileage of 35+ km per litre and will have a 200 cc engine. The car will be launched in 2012. However, the car might be exported first before it is available here in India. He was speaking at a press conference in New Delhi on the eve of Auto Expo 2012, the biggest auto show in India. "We have developed a four wheel vehicle with mileage of nearly 35+ km / litre. The car emits carbondioxide of just 60 gm per km," he told reporters. Bajaj Auto is known for its two wheelers and three-wheelers. The company is making a four-wheeler for the first time. However, the company could sell the car to Renault or Nissan Motors with minor modifications if they wish. Bajaj Auto shares were trading flat after slumping 8 per cent in trade on Monday. The December 2011 sales data was below expectation. Rajiv Bajaj said that Bajaj Auto would end the current fiscal with exports of Rs 6,500 crore representing nearly 1.6 million vehicles. He also said that it is extremely rare to find a car company with profit of over 10 per cent. “We are Apple kind of company. We believe in making niche products; we are an 'anti car' company. 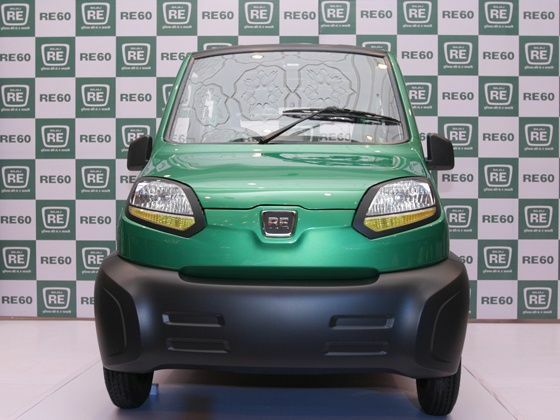 We are 2, 3 and 4 wheeler company and in this space, our investment can't be anywhere near a car company, investment closer to what one would invest as 2 or 3 wheeler maker,” said the Bajaj honcho.